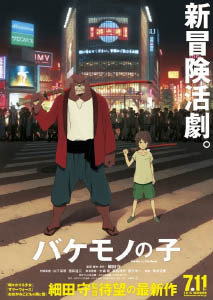 The Boy and the Beast (aka Bakemono no ko – English trailer) is a 2015 animated film from Japanese director Mamoru Hosoda, who directed the film Wolf Children in 2012. Both are of furry interest; this one even more so! 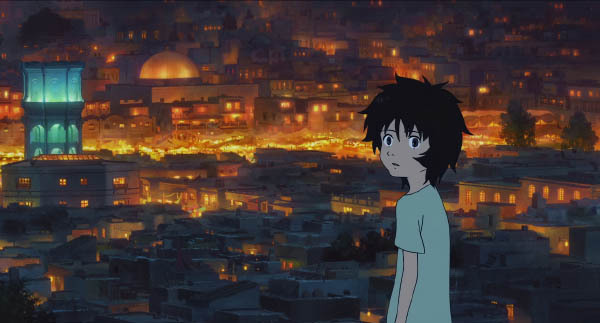 Ren is a 9-year-old boy who runs away to the busy streets of Tokyo after his mother dies. He has no way of contacting his father, whom his mother divorced, and has no love for his mother's relatives who want to take him in. Angry and upset, he wanders by accident into a parallel Earth, the beast world, where everyone is an anthropomorphic animal. In the city of beasts, the current Grand Master (a rabbit) intends to transcend and reincarnate into a god, with two possible successors: a bear named Kumatetsu, or a boar named Yozen. The two of them are gearing up for a martial arts battle. Yozen the boar is professional and composed, but not above goading his competition. He has a retinue of serious-looking apprentices, and is raising two sons, the older of which had been an abandoned human baby, whom he adopted. Kumatetsu, in contrast, is brash, obnoxious, selfish and unfocused, though exceptionally strong. He has no family, and no one will train under him, much less cheer for him or even bet on him in a fight. Still, everyone recognizes his potential. The rabbit Grand Master is particularly forgiving, and insists he find an apprentice. So, after a snide remark that he might as well train a broom or a human, Kumatetsu takes in Ren. The funniest part of this film is the complete lack of chemistry between Ren and Kumatetsu. Both are angry at the world, incredibly stubborn, and have no restraint in mouthing off to one another. At times it's sad, at other times it's really funny. Their relationship could best be described as antagonistic, combined with a refusal to give up or concede to the other. Respect gradually builds, although neither of them would ever admit to it. Their day-to-day arguments are observed by two friends, both monks, a gentle pig and a snarky monkey. Ren trains under Kumatetsu, although it's more accurate to say that they train each other. As time passes, the human teenager becomes restless and starts to cross back and forth between the human and beast worlds. This distances him from Kumatetsu, whose bad habits begin to reassert themselves. That's as much detail as I'll offer; the ending is positive though not without a little sadness. Much about this story universe is left unexplained, like why there are two parallel worlds, or what the role of Grand Master actually is. The beasts have the option of transcending and reincarnating as gods; humans do not. Humans, unlike beasts, are capable of being overcome by inner darkness, the possibility of which poses some kind of threat to the beast world. If you can roll with that kind of ambiguity, you'll be fine. I had a lot of story nit-picks with Wolf Children, whose universe was much simpler. Strangely, I don't have them here. 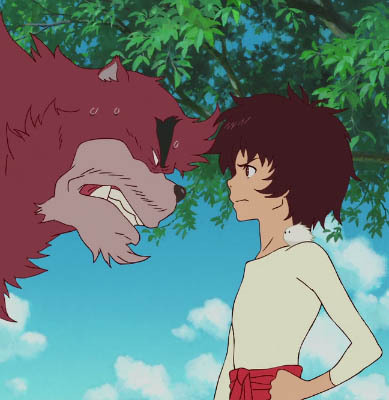 Wolf Children, however, achieved much stronger emotional highs and lows (especially towards the tragic); The Boy and the Beast has its little moments, but never quite delivers the same punch. The music and the backgrounds work well. As in Wolf Children, a couple of the backgrounds are modified photos made to look anime-esque, but it feels less blatant this time. Color and lighting tones were used to good effect, and a lot of the facial expressions really came through for me. I've watched a subtitled version, so I can't give an opinion on the English dub. Rotoscoping appears to have been used to make movement appear more realistic in some of the fights and crowd scenes. Furry-wise, the figures in the background are all drawn in a very simplified way, and are rarely interacted with. 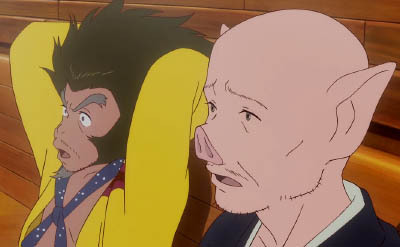 Westerners – even avid anime fans – may not be used to boars, pigs or monkeys as main characters, unless you've seen adaptations of Journey to the West. It's mostly animal heads on human bodies, although on the characters you get to see more closely, the fur is drawn with a just a little more attention. The bear and the boar both have the ability to "level up" and bulge into larger, more muscled, feral versions of themselves. It's also implied that horse people can shift between a two-footed and four-footed form, although this is only shown once (and very briefly at that). Overall, I think this is definitely worth a watch if you're an anime fan and don't mind a two-hour running time. The story is both a little tighter and a little looser than Wolf Children, although not as heart-tugging. If you're watching for the furry angle, well, it is furry, but outside a handful of main characters, it's nowhere near as strongly-designed as Zootopia. The world of the beasts looks different from ours, but aside from how the crowds look, it doesn't feel like it's a place designed by animals. If you're trying to introduce someone to anime for the first time, I'd probably choose something a bit more mainstream. The biggest strength in this movie is the relationship between the human child and his bear trainer. Both have had to rely on themselves to move forward in the world, with stubborn dedication and a willingness to persevere. At the same time, it makes a point that coping alone has also hurt them. Giving and receiving help isn't a weakness, but builds friendship and strength, filling gaps in the other person that they might not have managed to deal with by themselves. Even if the other person is a big gruff obnoxious bear, he comes through in the end. The film has recently had a limited release in theatres in the U.S., although I'm not sure if it's still showing, and a DVD or Blu-ray disc has been released in Japan. I watched this movie on the same day that I saw zootopia, and I laughed a lot more while watching the boy and the beast than I did while watching zootopia. Kumatetsu and Ren are hilarious in this film when they fight with each other. I really like the way the two characters help each other's growth during the film. I think that this type of relationship between a student and teacher where both the student and teacher go through an equal amount of character development because of each other is an unusual dynamic that I don't think I have ever seen played this incredibly well in a movie ever before, or even this well in any other media. I really think that this was a great film that deserves more mainstream attention. The only think I feel the need to complain about is that I wish the film had ended differently and been a little bit shorter. The English dub I think was done very well. Dude, spoiler warnings! Seriously, the fact that one of Yozen's sons is an adopted human is a major plot point! 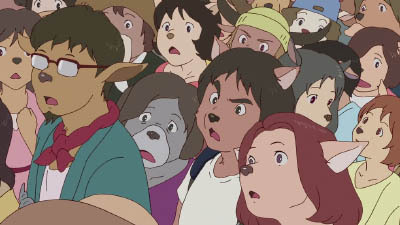 And as for much of the story's universe being unexplained, like many of his previous works Mamoru Hosoda's films are made almost entirely with a domestic audience in mind, so a lot of the elements of the story depend on the viewer having an intimate familiarity with either Japanese history or culture. Its one of the things that made me cringe after watching the original version and then hearing the English voice actors deliver lines that either completely glossed over what the Japanese dialogue was trying to convey or changed it entirely. Cultural dissonance can be brutal sometimes, but when there are no good English equivalents I find its better to just leave the delivery as is and let the visuals do the rest. As such, while there is no western equivalent to the Beast's World, in Japanese myth there are numerous references, especially in the Shinto religion, to the land where god's dwell, and while the god who lives in that land serves as the central pillar which acts as its foundation, without the presence of the god, the land will crumble into ruin. I know for a fact that I'm butchering that horribly, but like I said, there's no good English equivalent and much of the ideas that are present in the film rely on cultural context in order to understand. Though the Grandmaster's saying that he doesn't know what kind of a god he wants to become is a reference to this idea, and when Kumatetsu and Ren journey to the other lands and meet the other Grandmasters, the changes in dialect that each of them speaks indicates that each land is tied to a different prefecture in Japan. The inner darkness though is a Buddhist reference to those who are in danger of becoming an Asura, as Ren rejects the world around him an in turn is overcome by anger he begins to transform into a cursed being. There are a lot of other references being made throughout the film, but I'd say that knowing about all of them isn't necessary in order to enjoy the story being told, though it does help with the ending cause man, does it wrap things up fast. Aw, it's not that bad a spoiler. He looks nothing like his younger brother and wears one of those animal hoodies with tassles. :) But yeah, yours is the second comment I've read that there's a lot more to this film if you know the religious and cultural context. I would have never noticed differences in dialect. Thanks for providing extra detail! I've been an anime fan since 1976, and I've been completely unable to tell the differences in dialect even when they're supposed to be screamingly obvious such as the Hiroshima and Osaka dialects in "Hand Maid May" and "Azumanga Daioh!" I have been told by Japanese from outside Tokyo that they resent the Tokyo dialect being presented as the "correct" dialect, and anything else as "hick" Japanese, strictly for laughs. 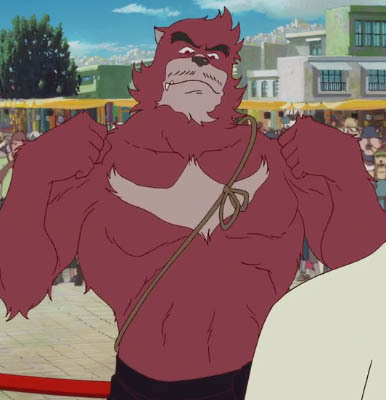 I don't understand why the fluffy martial art teacher is described as a bear at all; he is not even bear-shaped! Anyway, I am now noticing that Mamoru Hosoda does not like shadows. I don't understand Japanese media. I have friends who like manga and anime, I've tried getting into it several times, but it's just too weird for my taste. 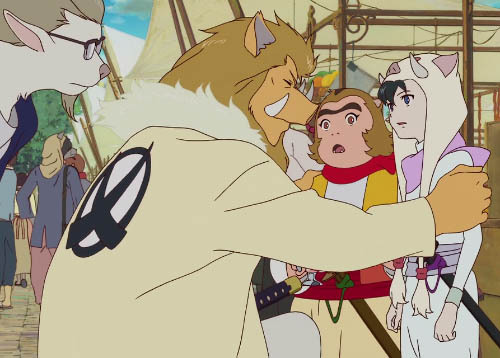 The beast in "The Boy and the Beast" does not look like a bear. Maybe he simply isn't? Have NOT watched it, so just guessing. And manga and anime are REALLY diverse. There are tons of stuff that looks nothing like this, but it gets little publicity. I have read more than one review theorizing that after Mamoru's last few films felt kind of female-centric (or even female-oriented), this time he appeared to be trying hard to swing the pendulum the other way and create something very MANLY. And so the film is largely a "sausage fest" -- in fact there is only one female character of any note, and even she seems to mostly function as a catalyst to motivate the lead character, Ren/Kyuta. Otherwise, the film is all about Manly Men doing Manly Things in a Manly Way. 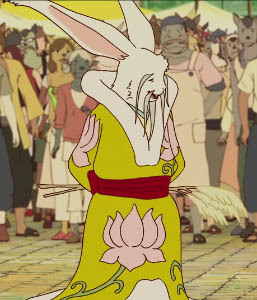 And can we also have a moratorium on badly-rotoscoped characters in animation who are just humans with animal heads drawn on them? ANime are very Popular these Days. I love to watch Anime.